As good as I am at gardening, I can’t seem to keep house plants alive. I have two problems, winter and my cat. 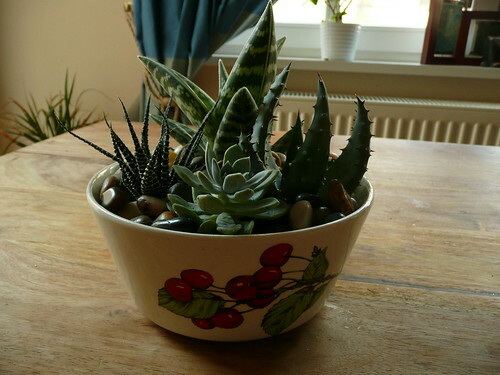 In winter, I tend to forget that plants exist because everything outside in Berlin looks so dead (Berlin is unfortunately low on evergreen trees and plants), and I often forget to water my house plants. Barring that, my cat will eat anything with somewhat edible leaves. 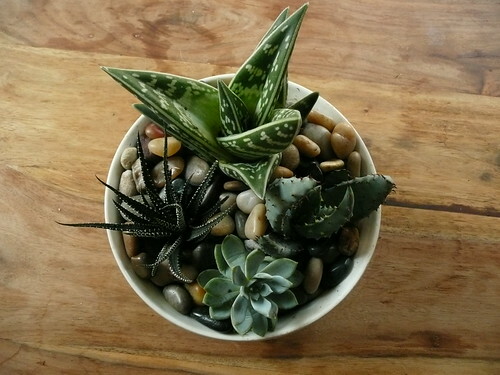 I do like to have living things around me though, so as a solution, I started getting succulents. They require very little water, and the leaves are too thick to interest the cat. I’ve started planting them in vintage dishes and cookware. I used decoration rocks at the top to help it look more attractive.